(Reuters) - A packed Caribbean Airlines passenger jet skidded off a runway as it landed in Guyana at night on Saturday, then broke in two at the edge of a ravine. There were no casualties. The Boeing 737-800 overshot the runway and burst through a perimeter fence after arriving at Georgetown's Cheddi Jagan airport just past midnight from New York. The front of the plane snapped off and it stopped meters from a jungle gorge. No fire appears to have broken out and only three people were hospitalized, one for a broken leg. "It's an absolute miracle what happened here in Georgetown," said Caribbean Airlines chairman George Nicholas, who visited the crash site in the South American nation. Passengers screamed when the plane lost control soon after touching down and many fled down emergency inflatable slides when it finally came to a stop. "Everything starting caving in and the girl next to me just sat there motionless in shock," said passenger Betsy Myndyllo, who escaped with the help of her nephews and left the crash on foot, in the dark, arriving at the terminal 20 minutes later. The plane came to a rest outside the airport, its front half broken off and its nose in thick undergrowth. "I saw death flash before me," said Guyanese-born Maxine Eversley, whose husband and niece were injured as they jumped to safety after the crash. Eversley was one of the 96 U.S. passport holders on the plane, most of them believed to be Guyanese-born. "We are very, very thankful and grateful that there are no deaths," Guyana's President Bharrat Jagdeo said at the airport. Flight BW 523 was carrying 157 passengers and six crew. 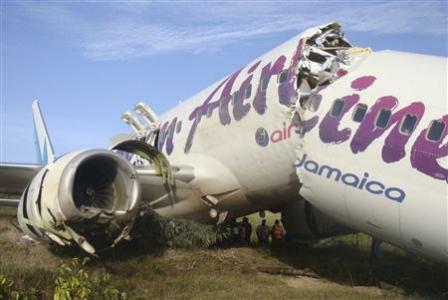 The Trinidad and Tobago-based Caribbean Airlines said it did not know the cause of the accident, which happened during good visibility and light rain. Investigators from the United States and Guyana were sent to retrieve the black box. The Canadian Broadcasting Corporation reported that 12 Canadians were on the flight, and one was slightly injured. A total of 35 people were treated for their injuries, including the plane's pilot, Edinburgh Gardens, 52, the Georgetown Public Hospital said in a statement. The summer months are a busy travel period in Guyana as many citizens who live overseas return for vacations. The airport closed for several hours after the crash but reopened by midday. Boeing's 737-800 model was introduced in 1996 and has previously suffered eight serious crashes causing a total of 525 deaths, according to the Flight Safety Foundation.